You should have seen this by now, but if you haven't, go see it. 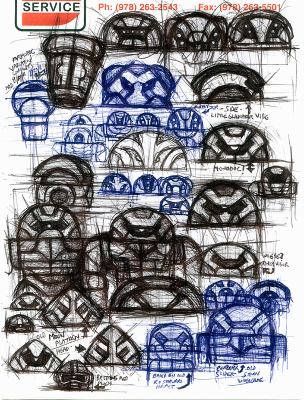 Lots of great concept arts and commentary on the Glyos Transmissions Web Log for the December 12 release of the first-ever Syclodoc! There are other pieces of art (like a colored yellow/blue version.) They are cool. I would totally buy that. TGB Customs strikes again! Check out this blog post which showcases the development of the spectacular new Infection Spyder Armorvor Head you see in the picture above. There's a very different looking prototype, sketches by Matt Doughty, design notes, and other refinements that should knock off whatever socks you happen to be wearing. Click here to see it. You're gonna like what you see. UPDATE: Delayed until December 12. Ah well! A few more weeks to save, kids. I look forward to it. Good gravy, that's a lot of good new stuff! A Dinobots-inspired Armorvor Aurustell Elite, the Syclodoc, tons of travelers, and oodles of other goodies are slated for a Friday launch. Click here to read it, or see the list we just hijacked after the cut. 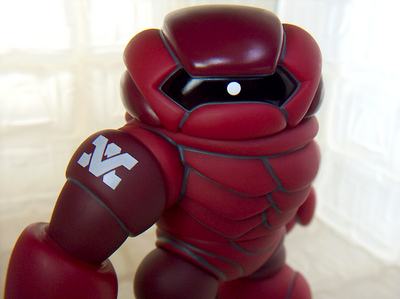 Meet the Sylodoc, a new vinyl creation from Onell Design. Being a sucker for anythign with the Glyaxia Command symbol, I gotta get it. Click here for the backstory on this new beast at the Glyos Transmission Web Log! Jason Frailey, the sculptor behind the Armorvor and the CyberGator head and other fine pieces, has a new one! The Gorilla can be seen in detail on his own blog, and ordered via the October Toys Forums. Click here to read about it, and go here to order yours. While there has been speculation we might see a new mold before the year is up - which hasn't been confirmed nor denied that I saw, but Matt has said that there's a red Armodoc with something different beyond color! Hmmm! Well, I'm excited. Metallic blue figures like Pheyden with a scarf, new Buildmen, and a stunning metallic blue Gobon are previews for the November 30 drop. Click here to read all the details so far, more are coming! 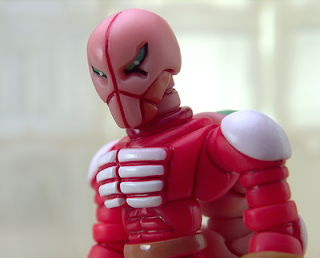 The first time this figure was sold, it had a harder resin scarf and was available for a short window of time through a special Glyaxia store. Now, Hades Pheyden MK II is available to everyone! Well, he was. For about an hour or less. Limited to 2 per customer, this nifty figure marks the debut of a PVC "scarf" accessory which does a surprisingly great job of changing the look and character of the figure with one tiny piece. Numerous other figures can wear it, like the Buildman or Govurom, but it seems a perfect fit for Pheyden and Scar Pheyden heads. 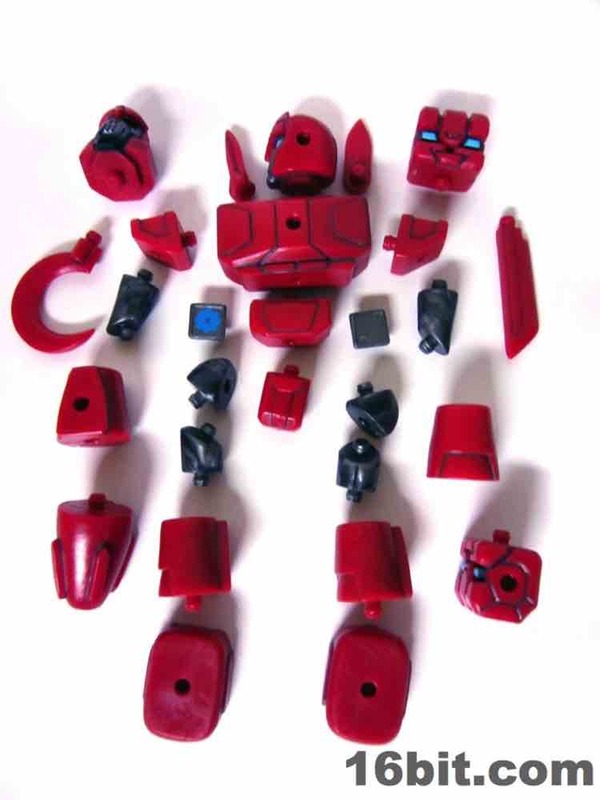 After its birthing from Onell Design, the Glyos System Series of toys has expanded rapidly with other companies building compatible lines like Banimon. The confusingly named Red Army 51st Corps is green, but the "red star" more or less confirms it may be allied to, you know, the reds. 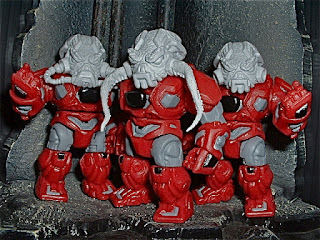 At about 1.3-inches tall, the figure is the smallest Glyos-compatible mass-produced PVC figure to date, while the Weaponeers of Monkaa seem to be the tallest. Based on the comics and artwork of one Boris Savic, these figures are adorably small with giant, swappable heads and a whole mess of weapons. 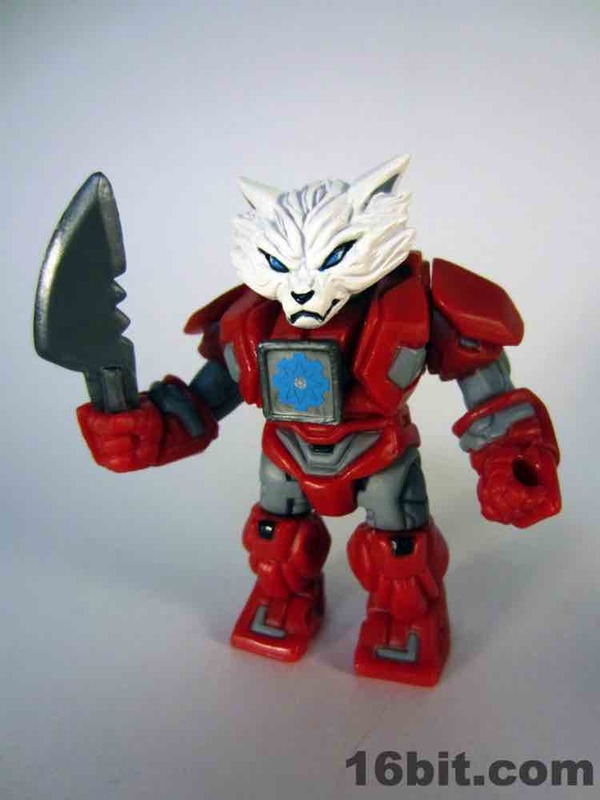 In many respects, they're similar to Battle Beasts and include so many spare parts you can use these to augment your other Glyos figures. 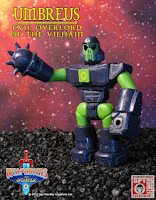 If you're a Glyos fan, you should get one or more of these. It's been a while, but with good cause. Something smells awesome! A new Callgrim figure (we don't know the name, so let's go with Strawgrim it's DX Callgrim Fragrian) is coming Friday, November 2, at 9 PM Eastern. 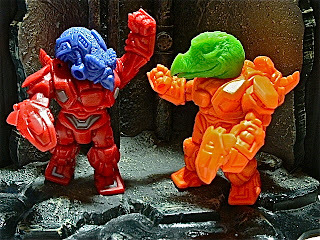 This reportedly scented action figure is the first-ever Glyos release to include, according to our source, (thank you Jesse!) vintage Kenner Strawberry Shortcake odors. That's pretty amazing and arguably one of the only ways to make this line even more awesome. What next, ooze? Nicely done, Jesse! Read all about it on the Callgrim Blog. And read this updated post too. 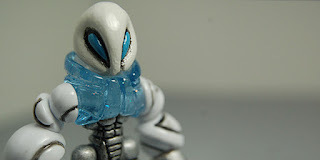 Friend of the site Nanite alerted us to a new custom sale, and the awesome Micronaut Glyan was too awesome to not share. Other Crayboth, Glyans, and a couple of other odds and ends can be seen in his October Toys Posting. Do check them out! 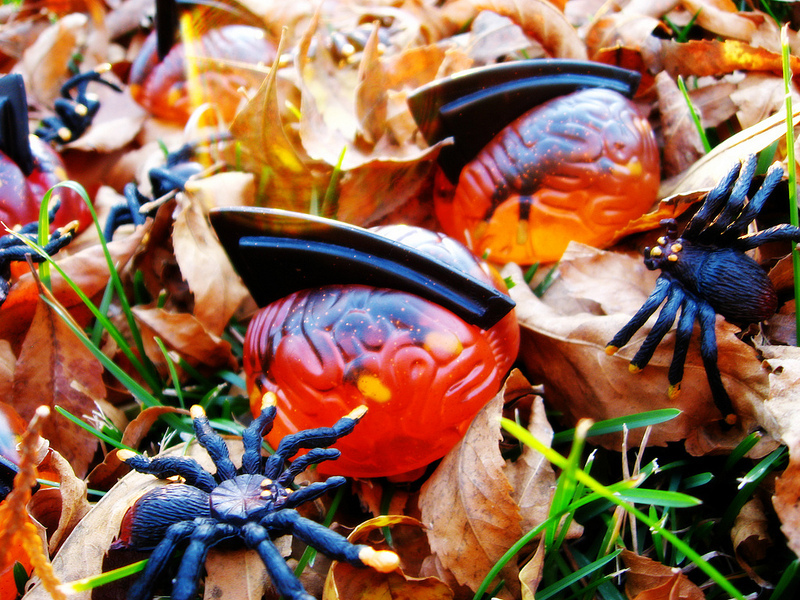 "Cast in transparent orange resin with orange glitter and a creepy toy spider embedded within! Fin is black with orange glitter. Extremely limited run to celebrate the Halloween holiday." 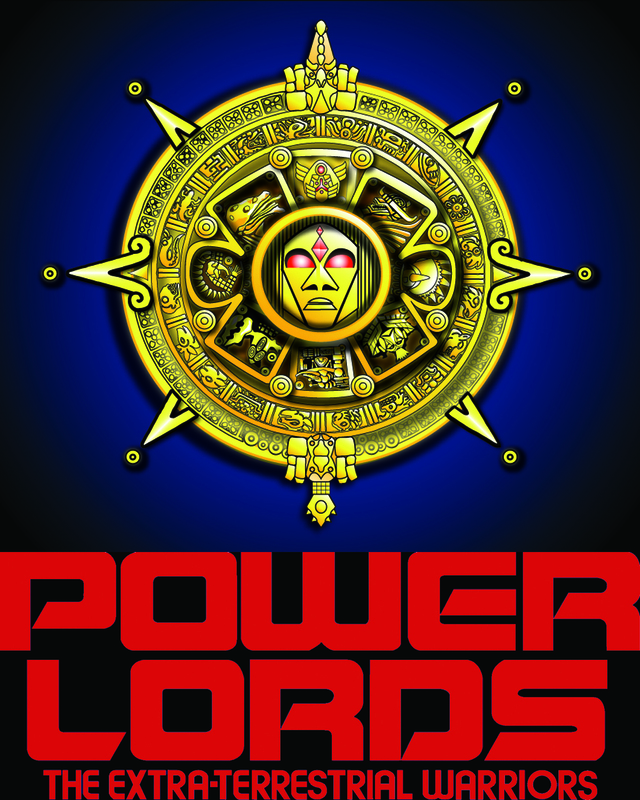 Click here to read more right now, and also check the Goboids store for availability! If you weren't online and ready to buy, you may have missed out. This batch of Armorvors lasted about 12 minutes, with the purple Neo Nebula Pheyden selling out first and all three Armorvors going next. Verexxan Armorvor (grey) sold first, followed quickly by Neo Nebula Armorvor, with Spectre Armorvor taking a few more minutes. With only 5 total figures, it was a pretty small drop and an easy one to buy in its entirety. (If you were early, of course.) The Armorvors had a limit of 1 per figure with Pheyden at 2 per figure. Stealth Crayboth is still in stock at press time. This was not a record sell-through, as some have asked: the last batch (clear and black) took about 8 minutes and the first figure took several times that. Don't forget! There's a drop of at least 5 new items on Saturday at 9:30 PM Eastern! Onell Design promises bigger runs, lower limits, and lots of purple so be there... or don't! This is a neat one. 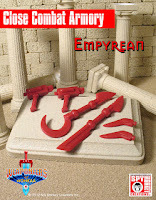 We saw some big expansions in Glyos in the last year, with Banimon and Spy Monkey Creations adding to the pile of PVC parts we already had from Onell Design, the Four Horsemen, and RawShark Studios. The new Weaponeers of Monkaa line is basically 1 pack of weapons and 1 figure painted and configured in multiple ways, so you can pick up Empyreus (or any of the figures) and get many, but not all, of the parts available in that color. 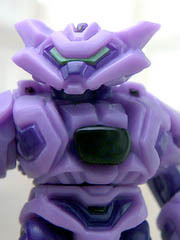 At about 5 1/2-inches tall at the ears, this figure is one of the larger Glyos releases and feels heavier than his siblings. While closer in size to the Outer Space Men, the figure has more parts and feels significantly chunkier, plus these have many-- arguably too many-- options for display. One figure is enough to keep someone busy for a while because there's a bunch you can do to swap around parts, much like Bionicle and other constructable figures. I'm trying to cut back on my purchases but usually regret it. I did buy Nonilla Pheyden but skipped the ultra-cool "Remnant" version, which makes me sad to this day. It's not that I regret my purchase so much as I was completely unaware Onell Design would be sending everybody a free Nonilla Crayboth on the house with their orders. But I digress. The cool thing about the Nonilla Pheyden is that Onell Poobah Matt Doughty indicated that this unique coloring was inspired by October Toys' own Z.O.M.B.I.E. line of mini-figures. Well! If this isn't a surprise, I don't know what is. 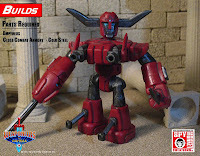 A few reports between our pal Seth, the Twitter, and October Toys Forums have revealed a few items we can expect in the coming weeks, or perhaps month(s). 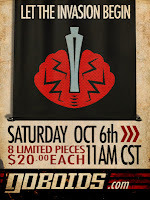 Be sure to swing by the October Toys Forums for more on the nifty newness. The image is courtesy of/stolen from October Toys forum member lhssenior, so go read his post and commentary and more so I feel like less of a filthy thief. 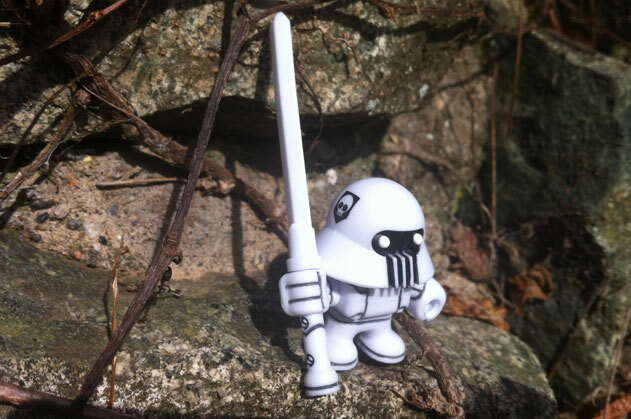 The fine crew at Onell Design posted 3 sneak peeks from October's Glyos drop. The good news: well, that's really good news. 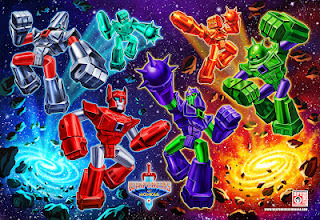 A clear Stealth Crayboth finally makes his debut, and is joined by the purple Neo-Nebula Pheyden and a matching purple Armorvor, plus more to be revealed. Are you excited? I'm excited. These will be available at New York Comic Con this weekend, and for those of us not at the show, online shortly. To see more, go to New York. 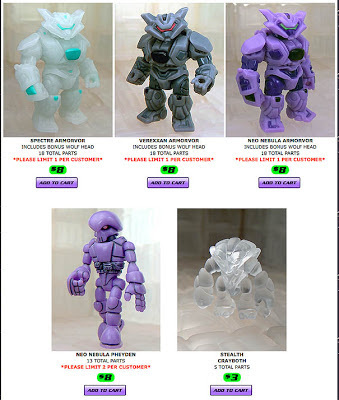 Or the Glyos Transmissions Web Log. 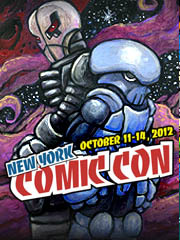 There's going to be a whole mess of people at the Onell Design (and friends) booth at New York Comic Con! They rotate the occupants every few hours, so you people there for the whole show will see an insane amount of fantastic, wonderful plastic things. Other booths have things for you Glyos fans, too! I will not be able to attend, so if you're there please take pictures and send me links to your blog entries, or send me your pics to post. I'd love to see what we're all missing! The full, long breakdown at booth #3216 (Onell, Callgrim, TGB, etc.) is after the break. (Clicky clicky, it's the same thing from Onell Design because I copied it and pasted it here as I am a lazy thief.) Be sure to stop by, The Godbeast always has something awesome to surprise you. Bring cash. You'll thank me after you spend all of it. 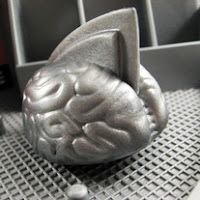 Over the weekend, some large custom Goboids brains went on sale and abruptly sold out. With about 8 one-off pieces, this low run was pretty much assured to go quickly. Each head sold for about $20 and looks great on Gobon bodies. And Monkaa too. Heck, just check it out, you're in for a treat. We'll do our best to keep you posted on the next run so you can get one! To the left, behold Empyreus, we knew him well. 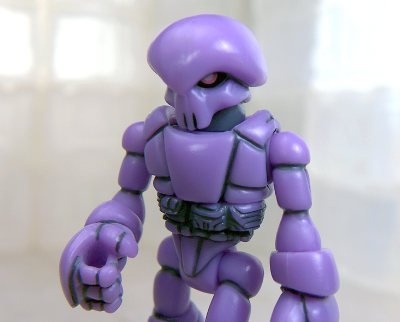 The figure is part of the Weaponeers of Monkaa action figure line, one of many new Glyos-compatible lines not from Onell Design. The picture, which comes from a review we'll be posting next week, showcases all the many parts you get in the $12.00 figure. I just figured you would want to see this sooner than later, so there are all 28 plastic parts. Also notable, Empyreus is pretty much the same red as Venjorun Armorvor, and his chest square fits (albeit loosely) on the Armorvor buck to give you a flat surface on which to put any fire/wood/water stickers you may have handy. Sure, it's a big flat surface, but odds are you'll be making your own stickers anyway. The Monkaa weapons also fit nicely into Armorvor hands, so hey, good times. The multi-person collaboration continues! Now with Ultra Thermal Dust, the Octo Armorvor is shown with lots of pictures on a Stealth Mimic body. Check out the breathing gear and tentacles, plus some color-change features, at the TGB Cutoms Blog! 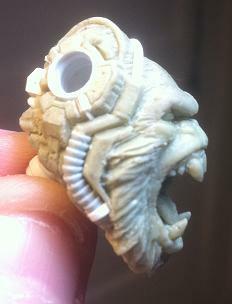 Don't forget that numerous TGB-made heads, including this piece, will be sold at New York Comic Con. Be sure to stop by booth #3216 to see this and other awesome items! 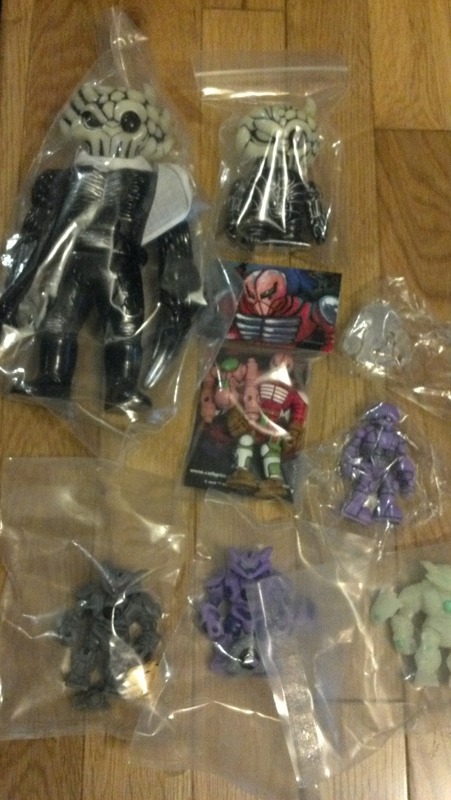 After a soft launch at Power-Con 2012, the Spy Monkey Creations Weaponeers of Monkaa toy line goes on sale today. To tease/celebrate, they posted a wide variety of alternate figure builds in addition to the ones that are already coming. With Banimon last week and Monkaa today, it's just the tip of the iceberg for October. 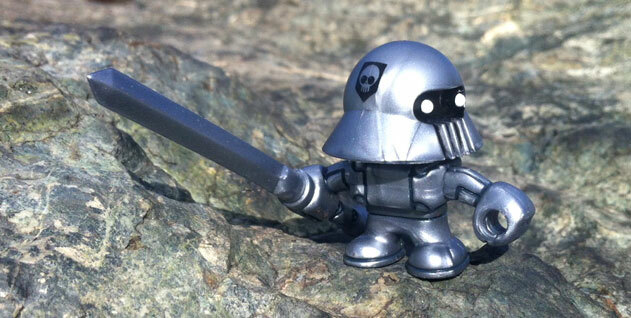 New items are expected for New York Comic Con from other Glyos makers, including another (small) Onell Design Glyos drop! I just got home from a trip and the first thing I did was to check the Banimon Shop to make sure the two new figures are still available, and they are! I ordered mine, so it's time to make sure you order yours, too. They're small, but nifty. 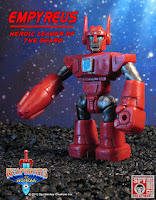 Also check out Doomkick.com for a review, which shows off lots of neat features and a swell "robot head" that hasn't been shown previously. UPDATE 9/28/2012 5:26 PM Pacific - 15 units of black & red Apocalypse and 42 units of the green Red Army remain. 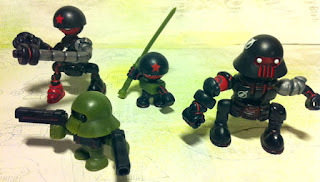 UPDATE 9/29/2012 5:11 PM Pacific - 0 units of black & red Apocalypse and 22 units of the green Red Army remain. There's a Ni Stuff Update! Alien Corp 2.0 will be at New York Comic Con 2012 at booth #3321, featuring numerous hand-cast parts like in the picture below. Fancy stuff. This is just a tease, and he promises more soon. But you knew that since you already check his site all the time, right? Good on you. This stuff looks pretty nifty! 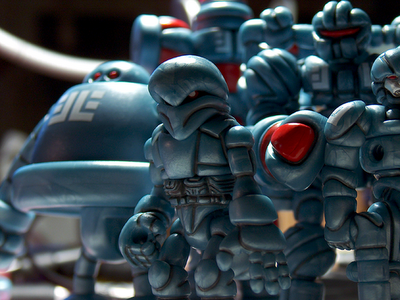 He has a small (and I mean physically small) gallery of Alien Corp figures from 2010 as well. With a few lucky fans getting shipped Weaponeers of Monkaa products early and others still having grabbed a few at PowerCon last weekend, numerous awesome custom creations have surfaced. But they all cower before JonWes' amazing Crystar build. This spectacular concept technically doesn't exist as no clear blue Monkaa parts have yet to be stamped out, but jeepers. Check that baby out. It looks like at least 3 figures' worth of parts were used, so keep that in mind when you consider which figures to get next week at the Spy Monkey Creations Weaponeers of Monkaa launch. For more on Crystar, click here. Continuing the proud tradition of super-cool custom heads for what may well be the hardest figure to acquire in 2012, The Godbeast and Jason Frailey have two new heads to gawk over. On the left (and below) is the multi-purpose octopus head. It has a few plug holes, so you can give it a beak, mechanical gear, and even tentacles to bring it to life. Preorders are not yet open, but TGB promises these will be on sale in limited quantities at NYCC in a few weeks. On the right, a Dark Crystal-inspired Skeksis head, also sculpted by Frailey. TGB teases additional head designs to be revealed shortly, but what? And when? Who the heck knows. Start saving your money, though, because apparently there's a whole mess of cool things to buy in the Glyosverse in October. Good news, unless you're me and will be on a plane! The Banimon debut figures will go on sale 6 PM Eastern on Thursday, September 27. There will be two different colors available and figures are $7. Each style is limited to 2 per customer. Click here for more updates on their blog, and thank your lucky stars if you don't have to travel for business. After more than a little bit of hype, Spy Monkey Creations debuted The Weaponeers of Monkaa at PowerCon and on their own blog. The above poster shows the main characters including Empyreus, Umbreus, the Crystal Gohlem, the Magma Gohlem, Palidar, and Brutok. These will be $12 each and the entire line launched October 1, 2012, at 12:00 Noon Pacific time. Oh, and in case you're just now finding this line, they are Glyos-compatible. 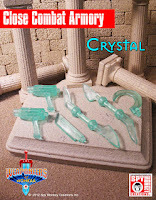 If you go to the blog and take a close look at the designs, you're going to notice there's a lot of shared parts as, fundamentally, what you have here is another construction kit-oriented figure. For example, the fist on Umbreus and Empyreus is also the Gohlem head. The spiked hand of Umbreus is the Brutok head. 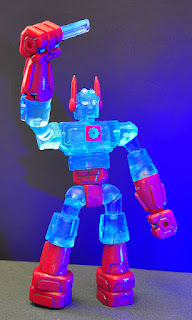 Much like the Onell Design Glyos figures, these use clever swapped parts as there's really only one figure with clever deco and construction change-ups to make them different. Leftover parts are being sold in a $5 head pack, although the heads also make great hands and weapons from the look of things. These things look really, really neat. Weapons packs are also available in six colors for $5 each.